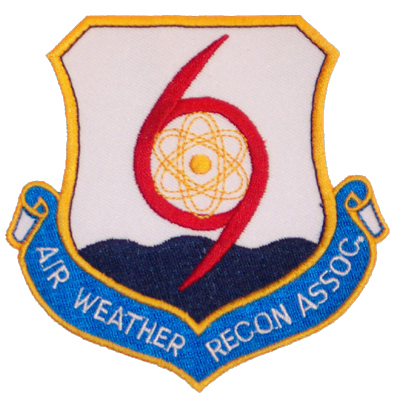 Of all the activities conducted by weather reconnaissance crews over the years, the most controversial involved attempts at weather modification. Remember the margarine commercial that said it wasn't nice to fool Mother Nature? Well similar things were said about efforts to alter hurricanes, which Air Weather Service attempted, along with NOAA, under Project Storm Fury. One of these days we'll discuss this effort in depth. This month we're looking back at another weather modification project, dubbed Operation Popeye. 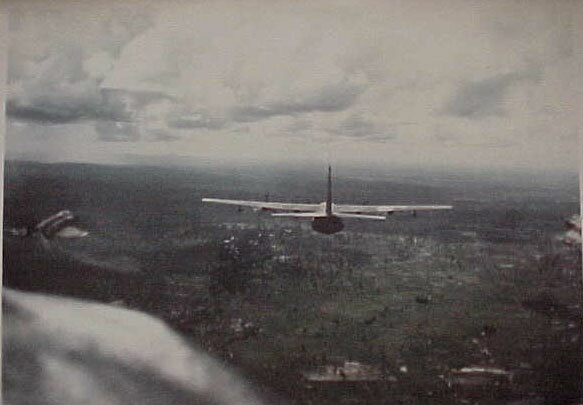 This mission tried to disrupt North Vietnamese logistics by making rain over the "trail". After some success during a test in 1966, the USAF assigned 3 C-130A's to the 54th WRS and, on 17 March 1967, the Typhoon Chasers also became Rain Makers. The mission was classified and met with varying degrees of success. Among 54th WRS crews, the rain making mission was known as Motorpool. Since the A-model C-130 was significantly different than her B and E-model cousins, the crews were required to attain, and maintain, specific qualification for these 3 aircraft. The crews also designed a patch to show participation. 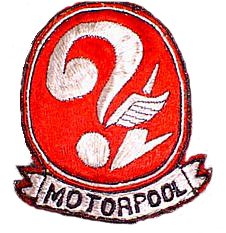 An example of the Motorpool patch is shown below. This image (slightly modified) came from David Steiner's web site. Who knows all the meanings? I've been told the logo indicates Operating Location (OL) 2, the 54th WRS Swan, a stylized lightning bolt to represent the rain making mission, and the question mark to signify the classified nature of the mission. Any other examples of the Motorpool patch or insights into its origins would be greatly appreciated. Contact the AWRA web master. The following information about the 3 WC-130A aircraft comes from Tom Robison's on line article WHISKEY CHARLIE. Tom is a former Met/ARE troop with both the 55th and 54th WRS. He is probably the foremost authority on all things WC-130, and most things dealing with weather reconnaissance (including atmospheric sampling). "Few aviation writers and historians seem to be aware that there were three WC-130As. These three were originally trash-haulers, borrowed from TAC in late 1966 for use in Operation "Popeye", the rain-making mission in Southeast Asia, set to begin the following year. The intent of the mission was to create enough year-round rain to keep the Ho Chi Minh trails impassable with mud. 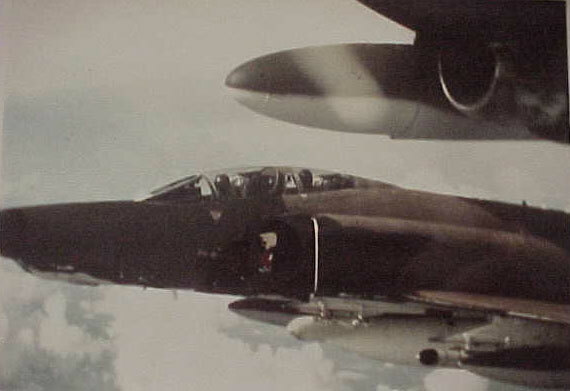 Tests were conducted over Laos in 1966, and the operational missions began in March of 1967 from Udorn RTAFB, Thailand. They were flown by crews of the 54th WRS, rotated on a regular basis from Guam. In addition, 54th crews were sometimes called upon to conduct synoptic weather reconnaissance from Udorn over various areas of Southeast Asia, out to and including the Bay of Bengal. The A-models were modified for weather reconnaissance, probably at WRAMA, with the AN/AMR-1 system. They were not configured for atmospheric sampling. Two were kept at Udorn, with the third rotating to and from Guam for maintenance, repair, and crew changes, from June 1967 through late 1970. When the third one was not enroute to/from Thailand, it was used for normal weather reconnaissance activities from Guam. In late 1970 the A's were replaced with three 1958 B-models, and the rain-making mission continued through mid-1972 with whichever B- or E-models were available from the 54th. 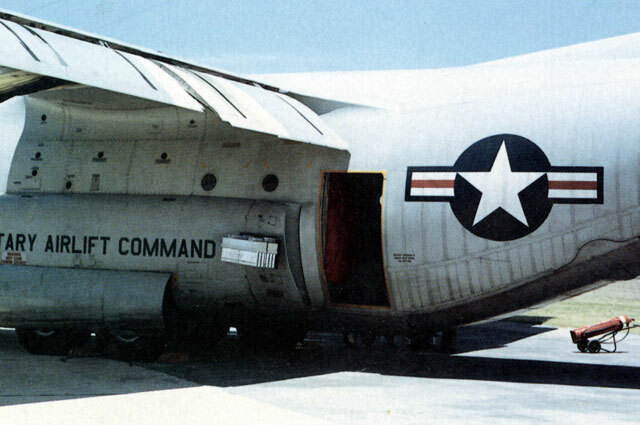 After re-conversion to transport, the A's were transferred to Air Force Reserve units. During their brief stint as rain-makers, they flew a total of 1435 "combat" sorties, and it is reported that at least one of them received battle damage. All three A-models wore the standard Southeast Asia camouflage colors and markings, but with no unit designations of any kind. In 1973, 56-0519 was given or loaned to the South Vietnamese Air Force, and it became one of the spoils of war on April 30, 1975. The last reliable sighting was in April of 1999, which reported her corroded and derelict at Tan Son Nhut Airport, Ho Chi Minh City." The 4 pictures below were all taken at the conclusion of the 500th Motorpool mission on 31 Jul 1968. As normal, two WC-130A aircraft took part, along with 2 F-4 aircraft which also participated in the mission. On this day, the 4 aircraft joined up for a celebratory fly by. The A-model's unique external fuel tank (outboard of the #1 and #4 engines) and 3-bladed props can be seen on the lead aircraft. A little friend swoops in to say "Hi!" from the RF-4C pilot's perspective. 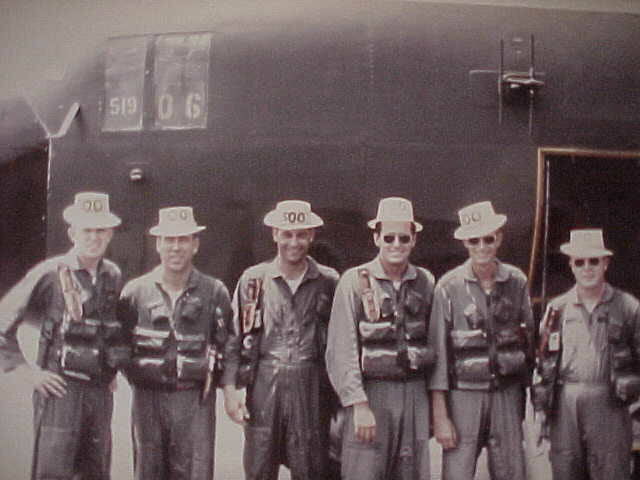 The 500th Motorpool mission crew members seen in this photo, L-to-R are: Capt Larry Hayes, Weather Officer; MSgt Jim Bird, Dropsonde Operator; TSgt John Travis, Flight Engineer; Capt Pete FitzGerald, Co-Pilot; Capt Byron Smith, Pilot; and Capt Daryl Wood, Navigator. The crew identification came from Pete FitzGerald. He relays that while both he and Byron were WC-130A-model aircraft commanders, it was Byron who was in the left seat for the 500th mission. 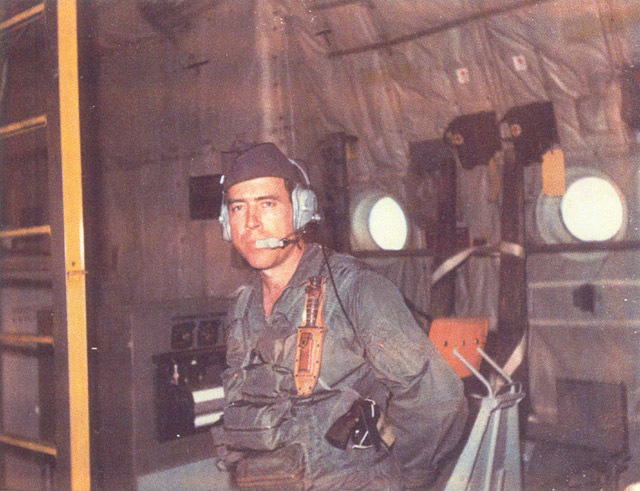 Daryl Wood served in weather reconnaissance for many years after his stint with the 54th, also flying with the 55th. He then spent time in AC-130s before returning to weather. He was assigned as the 41st Rescue and Weather Reconnaissance Wing Standardization Navigator for both the WC-130 and WC-135 prior to his retirement in 1981. Sadly, I have to report that Daryl passed away in October 2000. He was a good officer, fellow Air Force Academy grad, and friend. We miss him. 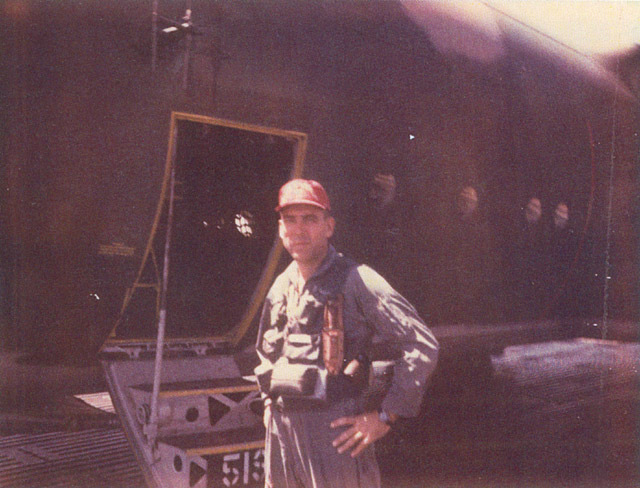 These two pictures of MSgt Jim Bird, Dropsonde Operator, were taken approximately the same date as the 500th Motorpool mission - 31 July 1968. They show him at the crew entrance door (above) and at his duty station (below) of aircraft tail number 560519. 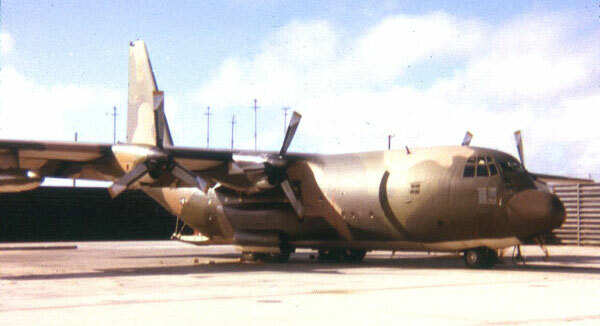 This aircraft, having been reconfigured for basic cargo missions, was given or loaned to the South Vietnamese in 1973 and was last reported to be derelict at Tan Son Nhut Airport. These two pictures illustrate the "business end" of the WC-130 rain making mission. 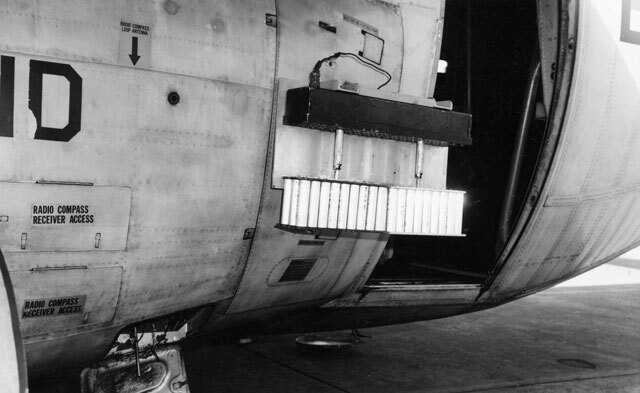 They show two different silver iodide ejectors mounted on the JATO rack of the left hand air deflector door of WC-130E, 64-0554 (above) and on an unspecified "B" model (below). These photos were not taken during Motorpool missions, but rather on Operation Gromet-II, an attempt to relieve a drought in the Philippine Islands in 1969. 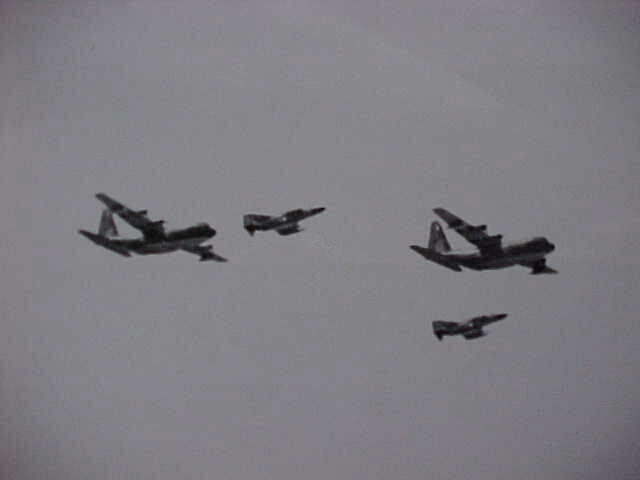 The 76 missions flown by 54th WRS crews from 29 April through 30 June 1969 were deemed highly successful. Tragedy struck the squadron on 16 May. A rack, similar to the ones shown above, inexplicably exploded on 554, causing fatal injuries to the ARWO, Captain Charles Booker. 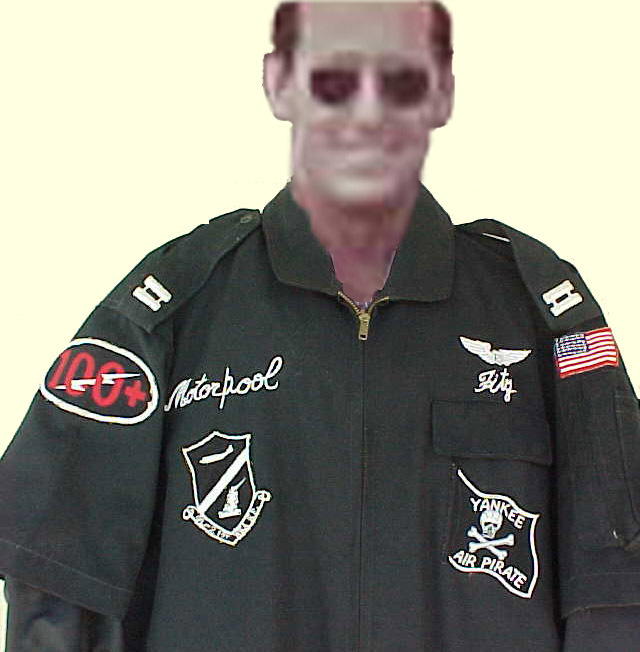 Pete FitzGerald was kind enough to share a picture of this "party suit" from his Motorpool days. I couldn't bring myself to display it hanging on a hanger, thus the badly Photo-Shopped image of a rather 2-dimentional Pete FitzGerald shown above. As all Southeast Asia veterans are aware, the party suit was only for parties - and should not be confused with any official uniform. Pete points out the OL 2, 1st Weather Group patch and the 100+ patch. Unlike the fighter guys who rotated out after 100 missions, the Motorpool crews were there for the whole 2 years. Most of the A-model crews had well over 100 combat missions before they left Udorn for the last time.